Parameter Tables is a plugin that allows you to manage parameters as spreadsheets. Infinite levels – 1 to 99, and beyond! Support for inputting custom parameters – though you would need a way to read them in your game. Initially, parameter tables were only assigned to classes. So if you had a Fruit Ninja class, you could have it use a particular spreadsheet file so that it will read all of its parameter data from there. By default, actors parameters are determined by their current class and current level. So if your actor was a level 5 Fruit Ninja, its parameters would be determined by the level 5 entry for the Fruit Ninja class. However, what if you wanted the actors to have their own parameter growths, separate of the class? Maybe you just want to use classes for the learnings and nothing else. 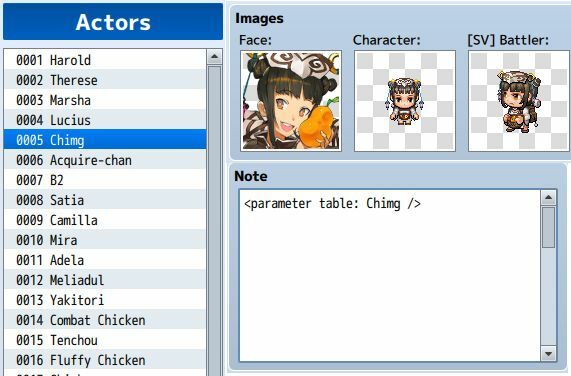 I have updated the parameter tables plugin so that you can simply note-tag an actor, and the actor will use the table to determine its own parameters instead of the class. There is an idea that I’m floating around at this moment where you can actually combine both the actor parameters AND class parameters. For example, let’s say being a Warrior gives you more Atk bonus, while being a Wizard gives you more magic attack bonus. You could have your actor with its own parameter growth, but then use the current class to provide extra class bonuses for using that class. For games where you can choose between different classes, this may become useful. Anyways that’s an idea so far. Want to use spreadsheets to manage your parameters? Get Parameter Tables over at its release page!